Scandinavians attacked this massive forest from north and south. 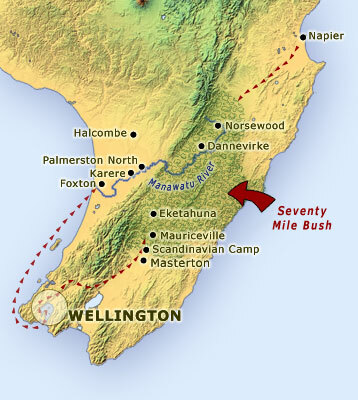 They walked from Napier and Wellington to the Scandinavian settlements, which they themselves had to create. Their routes are marked in red on the map. The clop-clop of axes and swishing of saws soon carried through the trees, and small grass clearings began to appear in the sea of forest.